Click here to read all my BVXP posts. 2) The loss of a particular product income source, which had generated revenue of £1m during the comparable year, but just £400k during the first half and nothing during the second (this loss of income was not mentioned within the RNS). Alas, the details supplied by BVXP do not allow us to determine the effect on profit from the loss of the terminated income. But I would like to think a 20% revenue advance near enough reflects the group’s underlying progress. Certainly the 20% annual dividend lift — plus a special dividend for the third consecutive year — underpins my rough sums. Well, I will take 23% sales growth as a “modest further increase” any day! “Whilst actual royalties received were once again in excess of expectations, we nevertheless perceive a plateauing of the vitamin D testing market. I calculate the vitamin D product represented 45% of group sales during 2018 — excluding the back-dated royalties and the terminated product income. My sums suggest these products saw their collective revenue jump 24%, from £2.8m to £3.5m. 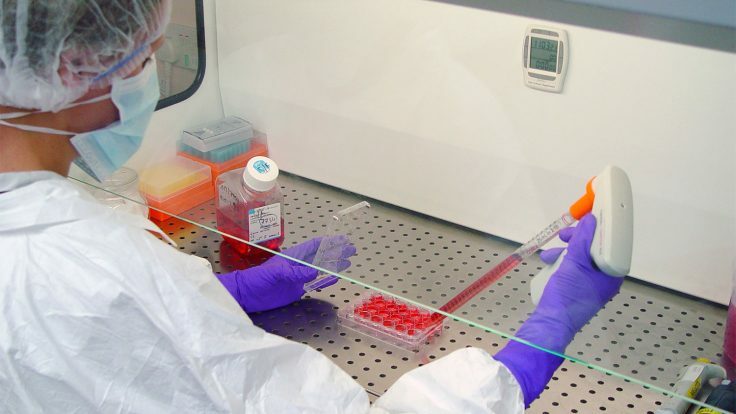 Excluding the contract product that expires during 2021, revenue from the other antibodies gained a more sedate 11%. Note that two antibodies saw their revenue fall: T3, down 9% to £460k, and estradiol, down 13% to £290k. Twelve months ago, BVXP reckoned the troponin test would exert a “significant influence” on sales for the year just passed. BVXP now claims the new product will have a “significant influence” on sales during “the next few years”. It seems BVXP’s level of optimism about the troponin product has fluctuated with every set of results. And currently, troponin income (initially at least) is at insignificant levels and below expectations. Oh well — I can only trust this product does eventually come good. I have read broker research that expects troponin sales to one day surpass £3m. A possible bonus from the RNS was the revelation that “another Bioventix licensee” had created a separate troponin test to rival the Siemens effort. BVXP expects this alternative product can in time generate the firm “some revenue”. BVXP’s financials continue to be remarkable. I calculate total capital expenditure has represented a tiny 1.2% of BVXP’s aggregate operating profit during the last five years — and the £108k spent during 2018 was relatively insignificant, too. Meanwhile, BVXP’s working-capital movements are somewhat larger — although the amounts absorbed have remained stable despite operating profit (before back-dated royalties) climbing from £2.4m to £6.1m throughout the same period. Most of BVXP’s surplus cash flow — £4.9m or 96p per share — was distributed as dividends during the year. The £0.8m left over lifted the bank balance to £7.0m or 136p per share. Accordingly, a welcome 55p per share (£2.8m) special dividend was declared. The balance sheet continues to carry no debt and no pension obligations. The company does like to use the word “modest”. Each time the “modest” growth projection turned into a 20%-plus advance. I just hope BVXP is trying to under-promise and over-deliver once again. Anyway, BVXP’s £6.1m operating profit (before back-dated royalties) alongside the 17.5% tax rate applied within these results gives earnings of £5.0m or 97p per share. Then subtracting the 136p per share cash position from the 2,700p share price gives an underlying trailing P/E of 2,564p/97p = 26. In the past I have pondered BVXP’s lofty valuation in light of the uncertain near-term prospects for troponin, and I dare say the lack of initial troponin sales has indeed left the share-price rating somewhat exposed. Nonetheless, adjust for the back-dated royalties and the terminated product, and the rest of the business has continued to grow at a very fair pace. …and you can understand why BVXP’s recurring revenue, super-high margin, wonderful return on equity and majestic cash flow have been prized highly by investors during the last few years. Just how prized BVXP’s future earnings will be is hard to say — although I would like to think the shares will generally trade at a premium to the wider market. In my experience, long-term quality businesses tend to be valued relatively highly. In the meantime, the 61p per share ordinary dividend supports a 2.3% income — although I would like to think BVXP’s apparent commitment to special dividends can bolster that projected yield to a sustainable 3%-plus. Here is the associated results presentation. I note the slides say the terminated product produced revenue of c£900k during the comparable year. The previous presentation (dated March 2018 for the six months to December 2017) suggested the terminated product had sales of £1m. So if I had used the £900k figure instead of the £1m within the Blog post above, my sums would have led to a small improvement of my underlying growth rate. gnnmatin, your post 897 seems to imply that Roche is a competitor, in the sense that BVXP’s chemical has to compete with other folks, chemicals. I don’t understand the market like that. As I understand it, the diagnostic equipment in a hospital is used for a whole range of different tests and is very expensive. So, a hospital that has Roche kit will not switch to Siemens kit because of marginal differences in one test – and vice versa. Iff this is correct then BVXP’s chemical has a fixed market to grow into – i.e. the number of hospitals that has Siemens kit – and no competitors. An informative presentation that explains the main attractions of the business. At 29m55s, a question is asked that reveals hospitals tend to keep their blood-test machines for about 10 years and that they are not “ripped out and replaced“. Siemens apparently has 10-12% of installed blood machine, so for troponin at least (which has been developed exclusively for Siemens), that is the size of the market and there is no effective competition. I too have half term with my 10 year daughter Jasmine at home, but my wife is Singaporean and of course a tiger mum as well, so there’s lots of homework to keep Jasmine occupied. 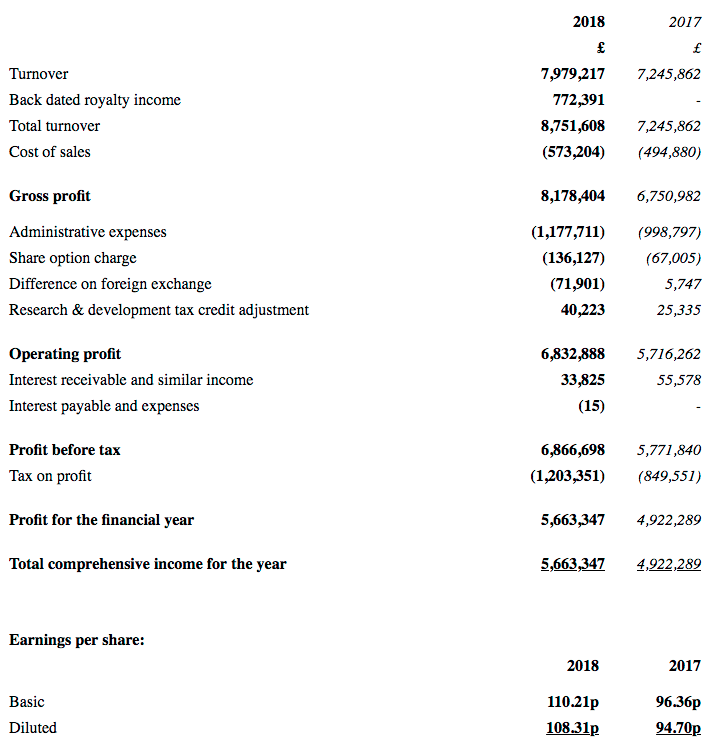 I have started to look through the shares on your “My shares” list that I’m not familiar with, and Bioventix looked particularly interesting, especially its amazing profitability. In your web site you very kindly take us through the questions you ask before deciding to invest, so I thought I would briefly run through my method, and would welcome any comments. The first thing I do with a company of interest, is complete my valuation spreadsheet, which is very quick and easy using SharePad. I developed this spreadsheet from the book written by Keith Ashworth-West called “Invest in the Best”, which I’m sure you have read. For the first run through with the spreadsheet, I use the consensus forecasts in SharePad, and then a figure of 15% for growth for the following 7 or 8 years, to make 10 years. I then assume a disposal value based on the PE of the average of the last 3 years, and if I have a rate of return (IRR) of over 20% I will then dig far more deeply into the company. In Bioventix’s case, I had an IRR of 24%. The next thing I do is read the latest annual report, check FE Investigate for subsequent announcements, check the ADVFN bulletin boards for adverse comments. I’ll then check both the Investors Chronicle and Shares for any useful comments. Next would be a search for any videos, which for Bioventix was easy, because your blog pointed out the October one. For larger companies, I’ll then read any employee comments from the Glassdoor web site. I then complete a scorecard I’ve developed to try to capture and rank all those factors I am looking for. I will end up with a score out of 100. I also return to the initial valuation spreadsheet, and substitute the initial 15% growth estimate for a more educated guess, and possible modify the 3 year PE figure for another value. I should then read competitors annual reports as well, but I never seem to get around to that! I then compare the scorecard value and IRR with those other investments I own, and in most cases take no further action, other than add the company to my FE Investigate alert list, so I can revisit the situation the next time results come out. In Bioventix’s case, its score put it in the middle of my portfolio, and so now I have to decide what to sell from those companies lower down the list. I currently hold 44 investments, which I know is too many, but as I’ve only been using my scoring system since June last year, I don’t have the evidence to check its validity quite yet. My return from 6th April 2018 to 6th October 2018 was 12% compared to the FSTSE AIM of 4.6%, so something must be working. Of course nearly all of that gain has gone now! Longer term, my intention is to very gradually reduce my investments over time, whilst minimising the amount of churn. Anyway, over the next few days I will sell something and buy Bioventix. BTW, when I make the purchase, I will use the Level 2 data I get via Sharescope to decide whether I should split my purchase into 2 or even 3 batches, and also the limit price to use. My experience is that the £240 a year is paid for pretty quickly, as its easier to buy within the spread. I hope you don’t take this message in the wrong way. I work on my own, and would find it extremely useful to receive comments that come from someone that knows what they are talking about. I you would be interested to receive my valuation spreadsheet and score card on Bioventix, I would be very happy to email them to you. (I would need an address). PS Lets hope the chancellor doesn’t remove BPR for AIM investments! Thanks very much for explaining how you evaluate your shares. I must admit I do not extend any forecasts for 10 years. My experience is that very few quoted UK businesses have the wherewithal to grow their earnings smoothly over such a long period of time. There are generally setbacks (major and minor) along the way. I tend to look for above-average companies trading on below-average ratings, but such opportunities have been few and far between during the last few years. When I bought BVXP, I worked out it traded on a P/E of 16-17, which did not look too bad given the firm’s previous growth rate and the decent financials. I did not become bogged down with projections, but that is my preference. Employing a scorecard and checklist is probably good practice. It can take the emotion out of investing, and perhaps prevent you from placing undue weight on a particular factor. For instance, my Tasty investment is due to management’s past record, but on other measures the share scores poorly. Perhaps a scorecard may have prevented my large loss there. Ultimately we all invest in different ways, with a certain amount of gut feel and intuition involved as well. You just need to find the approach that works for you, stick to it and not be swayed by others. Interesting that you say you would “find it extremely useful to receive comments that come from someone that knows what they are talking about.” There are actually very few online sites that cater for sensible investment conversation — Twitter, ADVFN etc are full of noise and little signal. Maybe one day I could find a solution. In the meantime, feel free to comment on this Blog. Hi Maynard, Thank you for your reply. I used to have exactly the same view as you do over 5 or 10 year forecasts; and still do over their accuracy. But please consider this. If such a forecast, with the current share price, and say projected growth of 15%, implied an IRR of 9%, would you invest? Probably not. The point being that this approach can indicate whether a stock is too expensive, given it achieves a reasonable forecast. I must say at the moment more stocks fail to reach my forecast hurdle than they do to meet my scorecard. A simple text-only report. Just the type I like. As before, these accounts are unusual as they are presented in the ye olde UK GAAP format, which does not provide as much disclosure as the usual IFRS standard. AIM Rule 19 allows UK companies without subsidiaries (such as BVXP) to present their accounts using UK GAAP. UK businesses that are formed of a parent company plus one or more subsidiary operations have to present group accounts using IFRS. 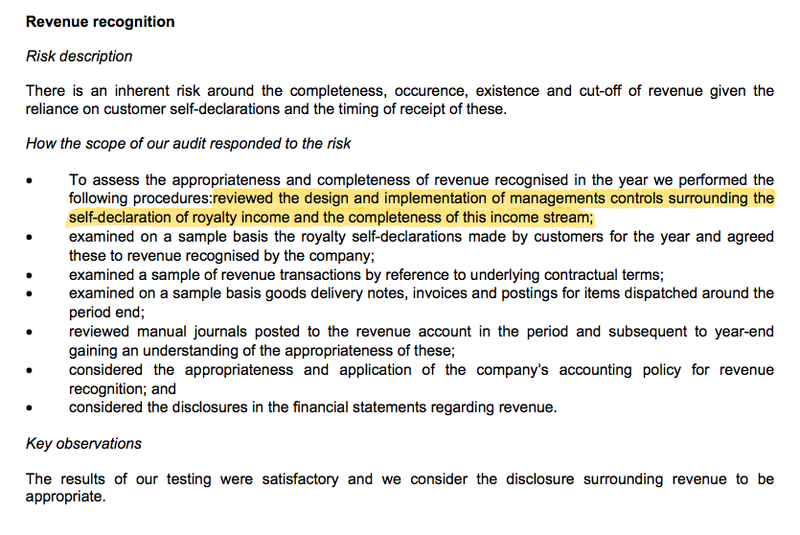 I bet the auditor’s review of “management’s controls surrounding the self-declaration of royalty income and the completeness of this income stream” follows the discovery of the late disclosure of royalties from a customer. I hope the review ensures all customers become timely with their royalty payments. Thankfully the annual report is spared the full details (cf Tristel). Instead, the full details are here. A quick skim revealed nothing too radical. Still, each employee on average generated a superb £583k of revenue for 2018, up from £453k last year and £165k in 2009. Total employee costs represented 11.6% of revenue, up from 11.1% last year but still lower than the 12% or more from the years before. I am hopeful BVXP’s already stratospheric operating margin might increase further should the company continue to grow its revenue and keep its employee team so small. 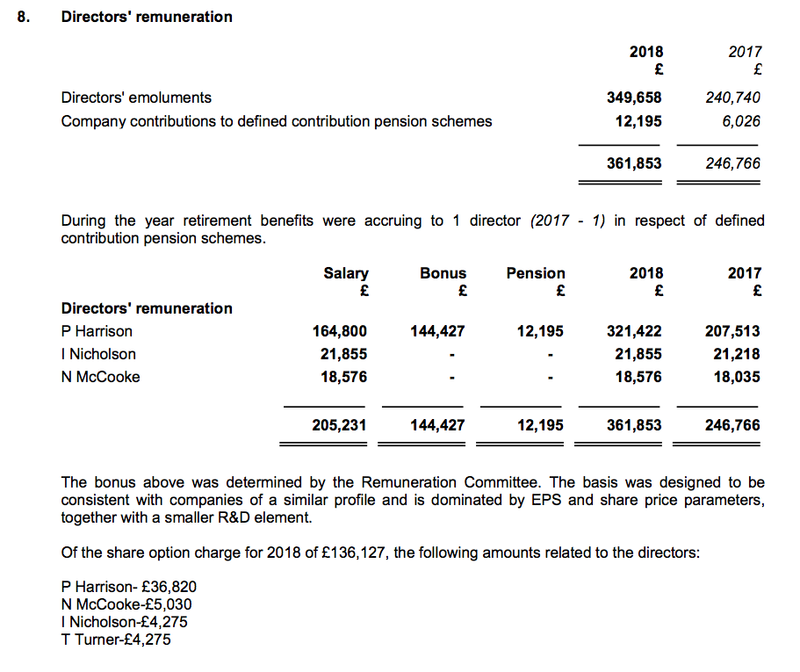 I can’t begrudge Mr Harrison collecting that bonus, a doubled pension contribution and what seems to be a basic pay rise as well. Five years ago his basic pay was c£70k, since when the dividend has shifted form 14.5p to 61p per share. I note the bonus was calculates using “EPS and share price parameters“. Would be useful to know what the share-price parameter was. Note 26 reveals the non-exec finance director, who works for a third-party accountancy, collected £17k. For most companies, trade debtors is usually the largest figure within the debtors (or receivables) note. But for BVXP, prepayments and accrued income is the largest. As I understand, BVXP carries a lot of accrued income — which reflects revenue earned during the period but where the customer had not yet been invoiced at the balance-sheet date. (Trade debtors reflect revenue earned during the period where the customer has been invoiced). BVXP’s customers inform BVXP of their global sales after the period end, and BVXP then invoices the customers for the appropriate royalty sum. As such, the revenue to be collected is deemed to be accrued income — i.e. the revenue had not been invoiced at the balance-sheet date. Anyway, the year-end prepayment and accrued income figure for 2018 is equivalent to 54% of royalty revenue, which compares to between 52% and 54% for 2015, 2016 and 2017. I am pleased the backlog of customer payments is not growing faster than royalty revenue. I see trade debtors has jumped from £452k to £824k. 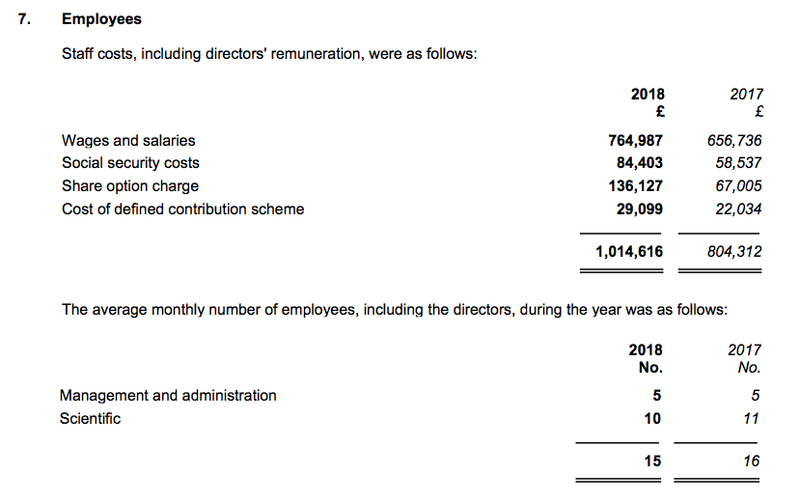 The 82% increase appears large, but the absolute increase of £372k is relatively minor given total revenue gained £1.5m. And as noted in my Blog post above, cash flow was very adequate anyway.